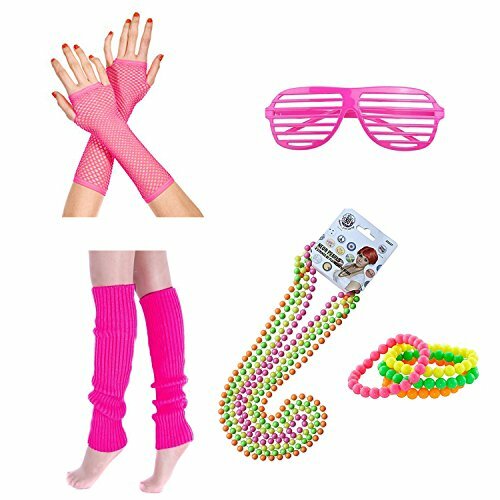 ❤Contents: 80s costumes accessories set includes hot pink leg warmers, neon necklace, neon bracelets, fishnet gloves and novelty sunglasses (as shown in the picture). ❤Size: stretchy legwarmers and gloves, one size fits all women and girls. ❤Neon leg warmers: made of acrylic, stretchable and soft. Fishnet length fingerless gloves: made of nylon and spandex. ❤Neon bracelets, necklace and novelty sunglasses: made of plastic. Make you become an attention grabber on the party. ❤Perfect for 1980s fancy dress costumes accessories for women, ideal for dressing up, dance show, disco, fancy dress parties, hen night, gothic, cosplay or other themed parties.